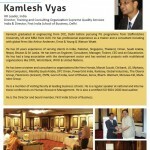 We are glad to announce our partnership with Possibilities Pvt Ltd for a workshop on Innovative & Best HR Practices. The business success is increasingly becoming a function of how well the organizations can win the war for talent and unleash the full potential of the human resources. In this endeavor, the onus is comprehensively with the HR professionals to strategize, operationalize and facilitate the systems that create the winning organizations. The practices that will be their tools have to be the very best – standard ones even if well implemented may not be enough- what is required are cutting edge practices implemented with great precision and care. Here is an opportunity to learn about the innovative and best HR practices that will enable you to create real business value in your organizations. 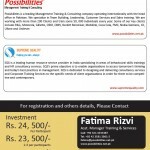 Organized by Possibilities Pakistan, its an interactive two-day training program targeted at middle and senior level HR professionals. 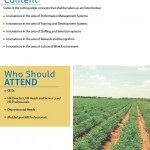 A program where the very concept, content and the facilitation will be the very best and very innovative. This is one program you would not like to miss. 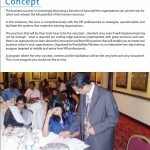 This entry was posted in Announcements and tagged Best, Employers, HR Practices, Innovative, Innovative & Best HR Practices, Islamabad, Jobseekers, Karachi, Lahore, Pakistan, Trainings, Workshops on March 23, 2011 by admin. WanTech is looking for a React Native App Developer. WanTech located at Johar Town Lahore, Pakistan.Candidate must be Computer Science/Software Engineering Graduate with at least 2 years of experience in Mobile application development, must have excellent communication skills and have a project-centric approach. Account officer :1- lookafter All payments of Puchase and sale of Fabric / yarn / manage processing bills .